Interest in understanding how characteristics associated with where people live, in addition to the characteristics of the people themselves, affect health outcomes has risen sharply in recent years. 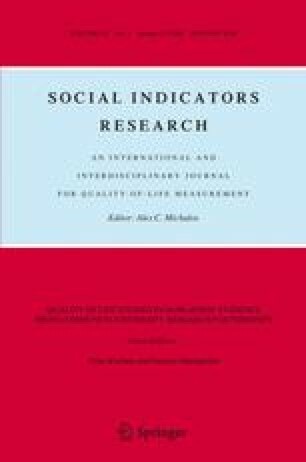 While much of the research examining this question focus on teasing apart effects of place and individual on outcomes, less attention has been paid to examining how individuals’ perceptions of where they live may provide some clues to better understanding the influence of place on outcomes. We present findings from analysis undertaken that incorporate the subjective responses of individuals, residing in three socially contrasting neighbourhoods, to their local environment. Our first question addressed whether perceptions related to neighbourhood and city of residence matter to self rated health and quality of life independent of individual characteristics, while the second question examined whether the perceptions and individual characteristics are modified by the neighbourhood socio-economic context. Our results show that perceived neighbourhood characteristics, in addition to individual sociodemographic factors, are significant correlates of self rated health and quality of life. Moreover, we show that the type of perceived neighbourhood characteristics and the magnitude of their influence on self rated health and quality of life vary depending on whether they live in high- versus low-socioeconomic status neighbourhoods. The authors acknowledge the assistance of Bill Holden and Lorette Keller for their assistance in this study. This work was supported, in part, by funding from the Social Science and Humanities Research Council of Canada (Community University Research Alliance Program). Dr Muhajarine is supported in part by a National Health Research Scholar Award, National Health Research and Development Program/Canadian Institutes of Health Research, and Dr Williams by a New Investigator Award, Canadian Institutes of Health Research. • How much do you feel part of your neighbourhood? • If there was a neighbourhood project organized, such as a block party or yare sale, how comfortable would you feel about participating? • Do you feel comfortable calling upon your neighbours for assistance or help during a crisis? • Have you volunteered in any organizations or associations such as school groups, church groups, community centres or ethnic associations in the last 3 years? • How would you describe your feelings of safety and security in your neighbourhood for you and family? Rate each of the following neighbourhood conditions as either excellent, very good, good, fair or poor. How do you feel about each of the following. Please tell me if you are very satisfied, somewhat satisfied, somewhat dissatisfied, or very dissatisfied.